This is a perfect holiday or fancy date night meal. The quick char and slow roast finish the lamb to a perfect medium rare, with a proper rest. Serve over a simple roasted vegetable for a photo-worthy dish. Clean and oil your grill. Preheat grill for indirect heat by building a fire only on one side of the grill. In a small bowl, whisk the mustard, salt, pepper, rosemary, brown sugar, garlic, and apple cider vinegar together. 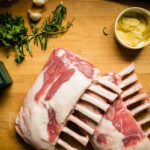 Rub liberally all over the racks of lamb and allow the lamb to rest 20 minutes before grilling. When ready to grill, place the lamb, fat side down on the hot side of the grill, and allow grill marks to appear, 3 to 6 minutes. Transfer to the cooler side of the grill and cook, lid down, for another 15 to 25 minutes for a temperature of 130 internal. Remove from grill, wrap in foil and allow to rest 10 minutes before slicing along the ribs to serve.